I'm not currently arguing here that the wound was actually 3 cm long. I'm merely pointing out that Olivier was using that description of it when opining on it. Quit being so dense. I'm not arguing you're claiming the wound was 3cm. I'm pointing out the wound was 1.5cm. It became 3cm after Dr. Shaw trimmed the jagged edges. Quit being the obtuse LNer. Just to repeat the question; how does a bullet that is 3 cm in length create a hole that in 3 cm in length if not by entering fully sideon? The wound that Olivier was asked to opine on was described to him as being 3 centimetres in its longest diameter. Whether 3 cm is accurate or not isn't relevant here. That's what Olivier was given to work with. Going with that description, he offered two possible causes for that wound. One was the bullet hitting while tilted from the perpendicular. The other was a tangential strike. That is , it was a tangential wound. An oblique, glancing wound. The "glancing" "non-penetrating" adjectives are yours not Dr. Olivier's. 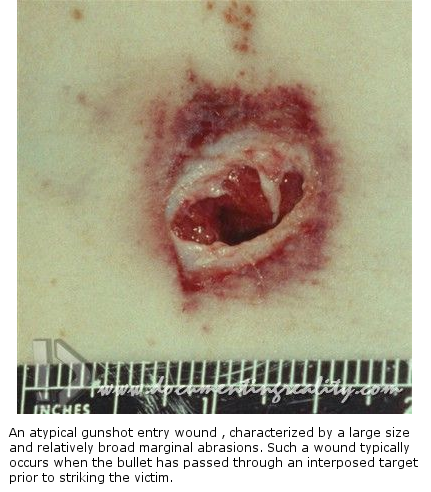 Besides, no one said that the bullet wound looked like it entered side-on. That would make the bullet wound look like the shape of the bullet. In order to make an elliptical entry wound 3 cm long the bullet would just have to enter at an angle of 75 degrees (cos(75)= .25) from the perpendicular to the surface (15 degrees to the surface). If Olivier had viewed what Sturdivan did, he would have been able to offer the same concrete opinion. The wound described by Dr. Shaw had to have been caused by a yawed bullet. Since you seem to be avoiding trying to answer it, perhaps Larry Sturdivan can explain how an elliptical entrance wound could be made by anything other than a pristine bullet striking at an angle from the perpendicular but, more importantly, why he thinks it wasn't. He still has never explained why "elliptical" means to him "ovoid", "egg-shaped" or, as you are suggesting, bullet-shaped. The "glancing" "non-penetrating" adjectives are yours not Dr. Olivier's. Besides, no one said that the bullet wound looked like it entered side-on. That would make the bullet wound look like the shape of the bullet. Does that look like the shape of a bullet? In order to make an elliptical entry wound 3 cm long the bullet would just have to enter at an angle of 75 degrees (cos(75)= .25) from the perpendicular to the surface (15 degrees to the surface). I'm sorry but I don't see where you get 3 cm from. Yes, the Cosine of 75° is 0.25. Well, closer to 0.26 really. How are you applying that to get 3 cm? Sturdivan doesn't need to explain it. The above photo speaks for itself. Also, "elliptical" and "ovoid" are synonymous with one another. It depends on what the bullet looked like and its dimensions and its condition. It did not necessarily hit sideways. If the bullet was large diameter and yawing it could have made that kind of entry wound - or if the bullet was deformed. In the case of CE399 which is 2.8 cm long and undamaged, in order to make a 3 cm wound BC's back wound due to tumbling it would have to hit side-on. A pristine bullet striking at an angle x to the perpendicular to the surface will make an elliptical entrance wound whose length to width is in proportion to:1/cos x. The wound was described as roughly 1.5 cm long. If the width was roughly .75cm it was roughly twice as long as the width so it could be made by a bullet striking at an angle of 60 degrees. 3 cm is 4 times the width which makes the angle cos -1(.25) = 75 deg. If we had accurate measurements we could be more accurate in the angle. An egg shape or ovoid shape is not symmetrical. An ellipse is. If you don't care about being accurate you can use them any way you want. If you want to say that an egg is an ellipsoid or a sphere go ahead. But it is incorrect. I dont know why people still talk about this bullet. Why do people say its an official truth? It's nothing of the kind. 1. created the bullet by firing it with Oswald's gun before the assassination for a reason that is not readily apparent. Since there is not only no evidence of the above but no rational theory whereby it even begins to make any sense, the possibility that it is not a bullet fired by the MC during the assassination is one that does not loom very large in the opinion of most reasonable people who have considered the evidence. The man who found the bullet on Connally's stretcher did NOT say that the one in the archives is not the one he found. WCC 6.5mm bullets are actually 3 cm long. But you're correct in acknowledging that in order to make a 3 cm wound in Connally's back it would have had to have been tumbling. I'll take that as your use of Olivier's testimony as being inoperative. The Warren Commission found "persuasive evidence from the experts" that a single bullet caused the President's neck wound and all the wounds found in Governor Connally. It acknowledged that there was a "difference of opinion" among members of the Commission "as to this probability", but stated that the theory was not essential to its conclusions and that all members had no doubt that all shots were fired from the sixth-floor window of the Depository building. You have to go where the evidence takes you. The evidence leads to the SBT.